We provide country club design focused on creating a welcoming environment that facilitates a shared community. With an important history of being the private, exclusive center for social and athletic purposes, country clubs must continue to adapt to changing times. With competing golfing venues, athletic facilities, restaurants, and entertainment venues, country clubs are faced with the need to upgrade, renovate, and restore. You want to preserve the historic charm of the country club while appealing to a more contemporary member. You need a modern club with updated color schemes and finishes that also keeps its unique style and character. 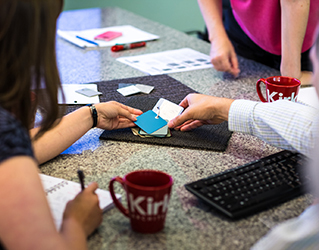 At Kirksey, we know that each club has its own style and brand, inviting new and existing members into a shared community. Our Hospitality Team works with club members and staff to produce a finished project which reflects the club's image and values while delivering an elegant, yet progressive design. We strive to become a resource for clubs and develop long-lasting relationships. From master planning, feasibility studies and renovations, to new buildings, Kirksey is able to help clubs reach the unique goals for their facilities and members. With more than 35 club and hospitality projects in our portfolio, we understand what it takes to design a welcoming environment for current and future generations of members alike. Whether it's renovating historic country clubs with modern updates that complement their original architecture or master planning new club facilities with the latest amenities, we know how to create unforgettable club experiences. We are Kirksey Hospitality, and we're here to provide you with exquisite country club architecture to grow your member community for the long-term.